I have some really exciting news that I have been dying to share. Finally a long time wish of mine has been fulfilled, I am now carrying paper crafting supplies in my Etsy shop IndigoWings. I am so happy that I have managed to expand my shop in this way and can't wait to expand it even more to contain additional crafting materials and eventually card kits. But as they say, Rome wasn't built in a day and everything takes baby steps. I will now be carrying scrap packs of two gcd Studio's paper collections to start; Loverly and Eye Candy. Although each of the collections is very different I think you will find that what they have in common is that they are beautifully made and are of a very high quality. I have definitely bragged about gcd Studio's paper on my blog before, so if your interested check it out here. I woke up this morning and knew the first thing I needed to do was draw a winner for the giveaway. I have to thank everyone who participated and who are now following my blog. I really appreciate it and can't wait to share more card creations and giveaways with you in the near future. So the winner for today's giveaway is Sara! 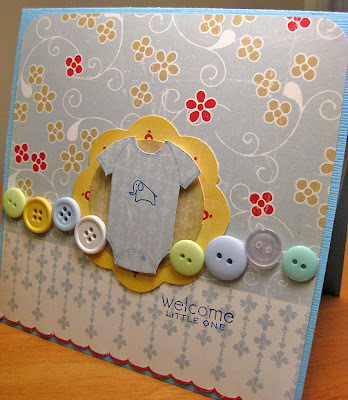 Congrats Sara--Sara just happens to be the founder and host of the Cosmo Cricket Fan Club on Paper Crafts Planet. Sara you certainly deserve a prize for all the work you put into keeping up the fan club. Please e-mail me your address to tina.erdos@gmail.com and I will get your prize out in the mail ASAP. Thanks again to everyone who participated and have a wonderful week. I Heart Cosmo Cricket... and a GIVEAWAY! 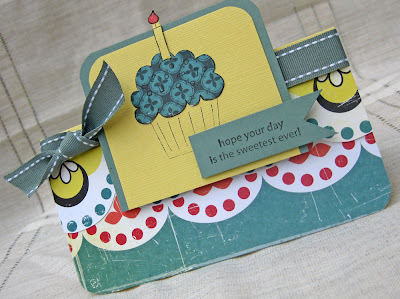 One of my very favorite things about paper crafting is using beautiful and lush patterned paper in my projects. I have a few favorite companies that I find I go to over and over again for my paper fix, one of those is Cosmo Cricket. I have a ton of their paper and have even been fortunate enough to win paper and supplies from a few give aways on their blog; http://cosmocricket.typepad.com/cosmo_cricket/. 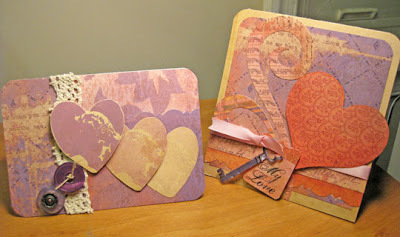 I thought I would share a few of my favorite cards that I have made using Cosmo Cricket papers with you today. I think what it is that really attracts me to Cosmo Cricket is their use of quirky color combos and bold patterns. I also love the eccentric design elements that they incorporate into their collections; for example one of my favorite collections is Mr. Campy and I just love the assortment of characters they came up with for their My Campy Adhesive Dye Cuts. Or another great example of their unique design sensibilities are the elements from the Early Bird Collection; the use of primary colors and the images of vintage toasters and other kitschy kitchen utensils is just superb. There is just something about Cosmo Cricket's paper products that really appeals to my sense of humor. I'm sure if I ever had the chance to meet the Comstocks or Lindsay we would enjoy a few good laughs together. Not to say that it's all just fun and games, because this is definitely graphic design at it's best and quality product to boot. I'm also a big fan of their Haunted paper collection. 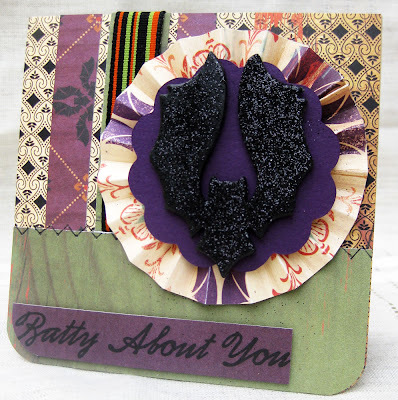 I just love Halloween and the patterns and colors of this collection just grabbed me. I finally busted it out to make a Halloween card, OK it's a bit early but I just couldn't wait any longer. It was so much fun finally getting to create with it. In keeping on the theme of all things Cosmo Cricket I thought I would offer my very first blog giveaway. As I mentioned earlier I have been fortunate enough to win some free product from Cosmo Cricket's blog giveaways, so why not pay it forward. Up for grabs is one brand new Jack's World acrylic stamp set. In order to qualify for this giveaway you must complete two things; first please leave me a comment letting me know what you love about Cosmo Cricket or what your favorite paper collection from them is. If you just heard of Cosmo Cricket just let me know, that's OK too. Second, please sign up as a follower of my blog. I will then enter your name into a random drawing and will announce the winner on Monday July6th. Good luck!